I am breaking away from our normal DIY and home related content to share a personal story today. 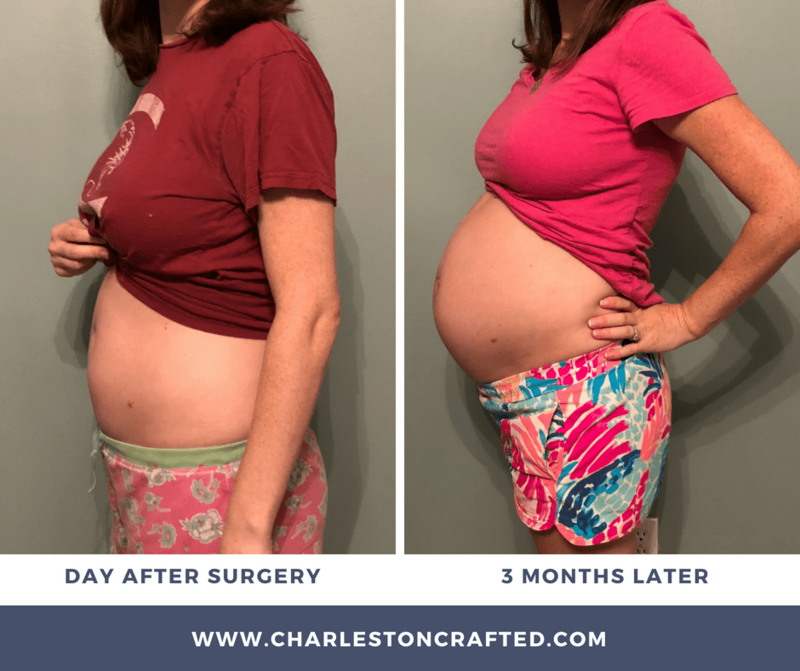 I am sharing the story of having a dermoid ovarian cyst removed during pregnancy to try to help others who might be facing a similar situation. Whether you have an ovarian cyst, need a appendectomy during pregnancy, or just are curious, I hope that this helps! I want to go ahead and note that I am NOT a doctor or a medical professional at all. This is just my experience. Please consult doctor before making any medical decisions. 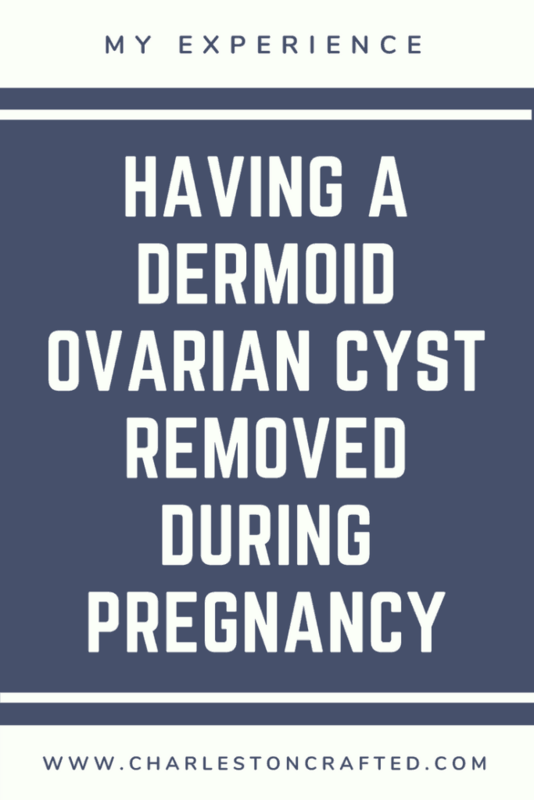 I actually had no symptoms with my dermoid ovarian cyst. Some people experience swelling, pain, or bleeding, but I had none of these. So, how did I know that I had a cyst? My OB/GYN identified a potential ovarian cyst during a routine ultrasound. I was at her office because I was 8 weeks pregnant and her initial dating scan indicated that my ovary was about 3 times the normal size – about 6cm in diameter. She scheduled me for a follow up ultrasound the next week with the maternal fetal medicine office, which has much more sophisticated scanning equipment. At this point, I was kind of confused. I truly didn’t understand the severity of what was happening and didn’t write down enough of the medical words that she said to be able to google it properly. The next week, I had my follow up ultra sound. When the tech cut on the machine and began my scan, the first thing she said was “Woah. That is huge.” This is the first indication that I got that there was something really wrong. She measured the cyst and the ovary and sent those measurements to my OB/GYN to diagnose. A few days later, my doctor called me to tell me that I definitely had a cyst. 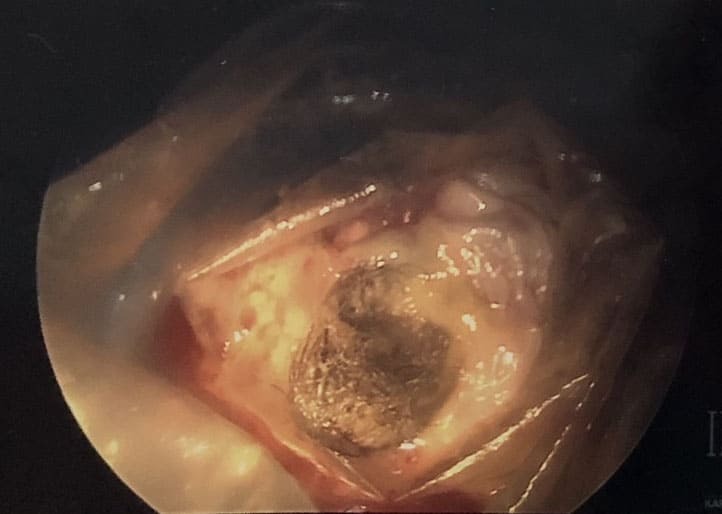 She suspected (due to the scan revealing that it was mostly liquid-filled with one solid pocket at the bottom) that it was dermoid cyst but couldn’t be sure until they got it out. Her recommendation was to remove it at fifteen weeks pregnancy. I returned for more scans at 14 weeks (after scheduling the surgery) (4 weeks after my initial scans) and the cyst had grown to 11 centimeters in diameter. So, in 4 weeks, it essentially doubled. To almost 4.5 inches across. That’s bigger than an orange, about the length of an iPhone 5s. That’s INSANE. Have it removed via laparoscopic surgery around 15 weeks gestation. This was the safest window for having it removed because I would be past the first trimester (and therefore the fetus would be more likely to survive general anesthesia and the general trauma of surgery) but my uterus would still be small enough that it would not be in the surgeon’s way during the procedure. Wait and have it removed after the pregnancy. This of course would eliminate the chance of there being a side effect from the surgery to the baby (including general anesthesia, the doctor slipping and slicing the uterus, or just fetal demise due to the stress of the procedure). But, it also ran the risk that the cyst could continue to grow and burst. If it burst, it would be very painful, but it would also fill my abdomen with whatever liquids or solids were inside the cyst. I’d have to have emergency surgery – and if I was over 18 weeks pregnant they’d have to do a full c-section style cut. Once in the third trimester, they’d have to do a vertical cut down the center of my body and perhaps c-section the baby early, as well. This is going to sound dramatic, but this was the hardest decision that I have ever had to make in my life. I did not want to get surgery. I cried about it, a lot; I got second opinions; I doubted myself, my doctor, the internet. It felt like getting the surgery was first of all really scary because I had never had surgery before, potentially unnecessary since I felt no pain or symptoms, and really risky to this poor fetus/baby that was just along for the ride. So, how did I decide in the end? It was actually a combination of two things. Multiple doctors said it had to come out one way or the other eventually. The fact that my choices were to get the surgery now or six to eight weeks postpartum made a big impact. I wasn’t getting out of this either way. The idea of recovering from surgery with an 8 week old baby at home sounded horrible. I wanted to be able to focus on me now and the baby once he was here. Secondly, I was worried about worrying. If I didn’t have the surgery, I would continue to obsess over the cyst. Every twinge would be my cyst twisting and preparing to burst. In the end, I decided to schedule the surgery for May 2nd, when I was 15 weeks pregnant, and the day before my 29th birthday. My surgery was scheduled for 7am, which meant that we had to be at the hospital at 5:30am! I was prepped by a series of nurses before the nurse anesthetist came in and began my pain killer drip. They assured that everything was pregnancy-safe. I was trying to be silly and joke with all of the staff, but I was really, really scared. As it got to be time to be rolled back, I started to cry because I felt so very helpless. The last thing I remember is rolling back into the surgical room and taking deep breaths from a face mask. The next thing I knew, I was waking up in the recovery room. Note: I was being silly (on drugs) and making this face during recovery when people asked me if I was ok. 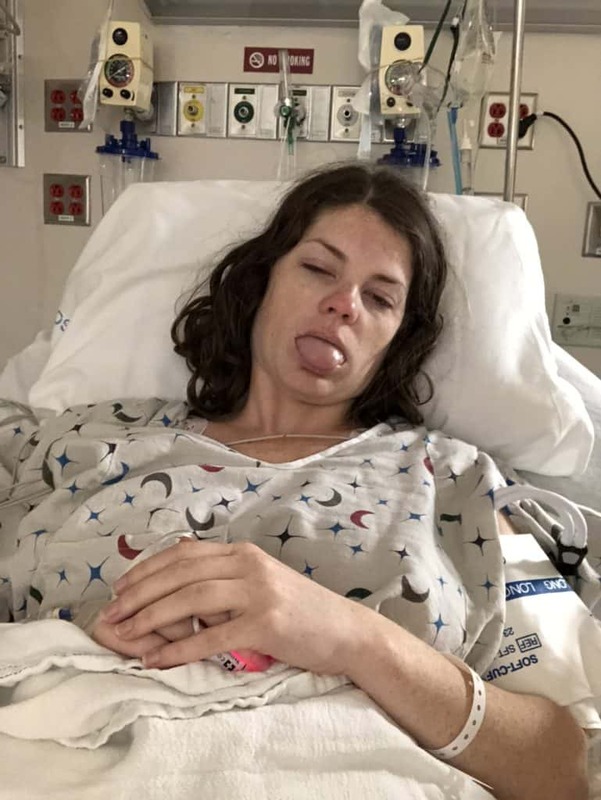 It was a joke but is also somehow the only photo we got of me in the recovery room since every time Sean went to take a picture, I stuck out my tongue like this. Always being hilarious! The surgery took about an hour and in the end they had to remove my entire ovary and tube. 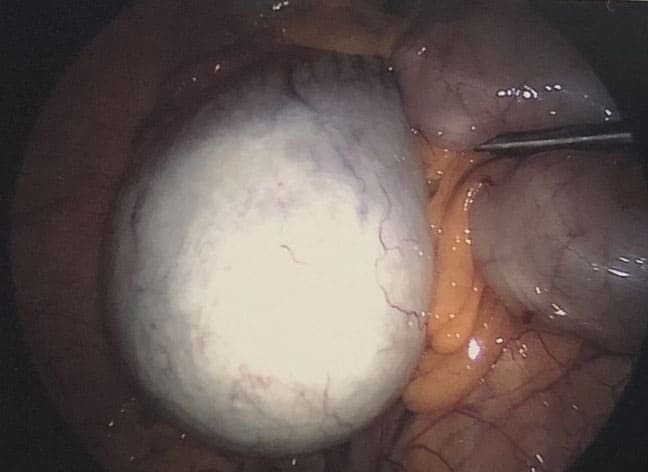 The cyst was inside the ovary and not attached to the outside – there was nothing to separate it from. The tube was swollen and unsaveable. As you can see here, it was basically a large hairball with some fatty deposits surrounded by liquid inside the ovary. Sorry about that, I blame it on the drugs. After the surgery, I was able to stand up pretty quickly. Also, I had to prove to them that I could pee before I was allowed to leave. I did have a burning sensation and it turns out that was because I had a catheter put in and taken out all while under anesthesia. After about an hour of being awake, Sean was able to go get the car. I was wheeled out and they let him take me away. I basically felt very drunk and sleepy but zero pain. That afternoon, I essentially slept on the couch. I was on an oxycontin regimen (apparently oxy is pregnancy safe but Advil isn’t! Silly doctors) and stayed pretty drowsy. I think that I might have eaten some plain pasta but I honestly have no recollection. The next day was Thursday. Sean worked from home that day (he was off the day of my surgery) and was my nurse/babysitter. It was also my birthday! A bit different from my 21st, but at least I wasn’t at work! I really slept for most of the day, but we did take two walks around our neighborhood. The doctor said that walking and moving would help with the gas in my body. I was lucky that I didn’t really feel like I had much gas in me. I had some trouble getting up off the couch because of abdominal pain (only when I made the crunching motion of sitting up) and was glad to have Sean to pull me up. On Friday, the 3rd day after my surgery, I felt much more awake but still tired. I mostly watched TV and ate sandwiches. I went back to work on Monday, 5 days after my surgery. Luckily, I am able to work remotely from home. So I worked from the couch, but I was completely off of the oxy and honestly could have gone to the office if I needed to. If I had a physical job, I would have needed more time, but desk job for the win on this one. At this point I could sit up just fine and walk around without issues. My doctor instructed me to not exercise (except walking) for six weeks. This was really hard for me as I had gotten into a really good spin + barre routine! Honestly, at the end of the 6 weeks, I was 21 weeks pregnant and really lost my mojo for the workout classes. So, the surgery did kind of derail me in that way. My insurance was billed about $32,000 for my laparoscopic oophorectomy. I am lucky to work for the hospital so I had a flat co-pay of $250 that I pre-paid. 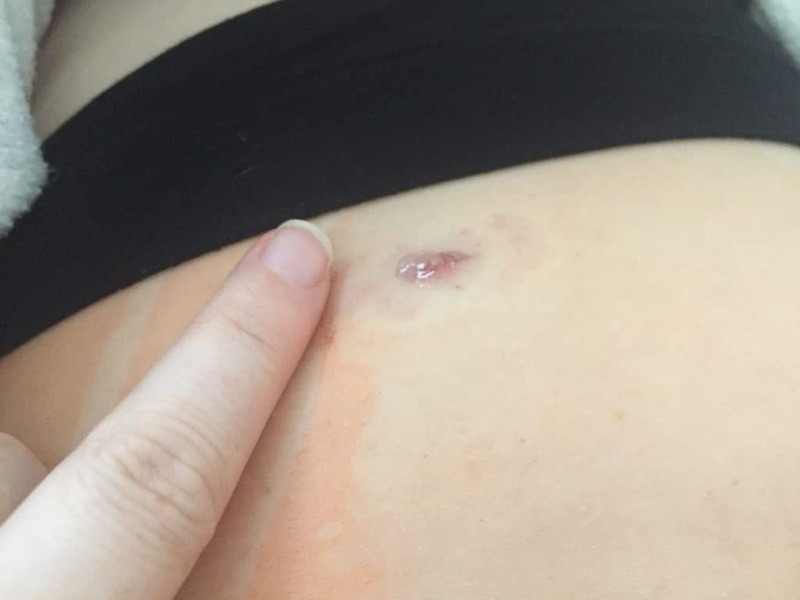 I have gotten so many questions about the scars from my laparoscopy, the healing time on the stitches, how my belly button looks, and requests to see photos of my laparoscopic surgery scars. So, I will comply. As I mentioned, there were three incisions: one in my belly button, and one on either side of my abdomen, about at the widths of my hip bones. I believe that they usually do these lower, by the bikini line, but due to my uterus being swollen with pregnancy, they had to be a little higher. This is my scar the day of my surgery. It’s “wet” looking due to medical glue used to hold it shut. There were no external stitches. Honestly, the surgery and recovery were so much less of a deal than I imagined. At no point did I feel any sort of even semi-significant pain. My medical staff took such good care of me. I felt complete relief once it was over and that I was able to focus on the pregnancy completely! Are you facing an ovarian cyst? I’d love to discuss it with you. 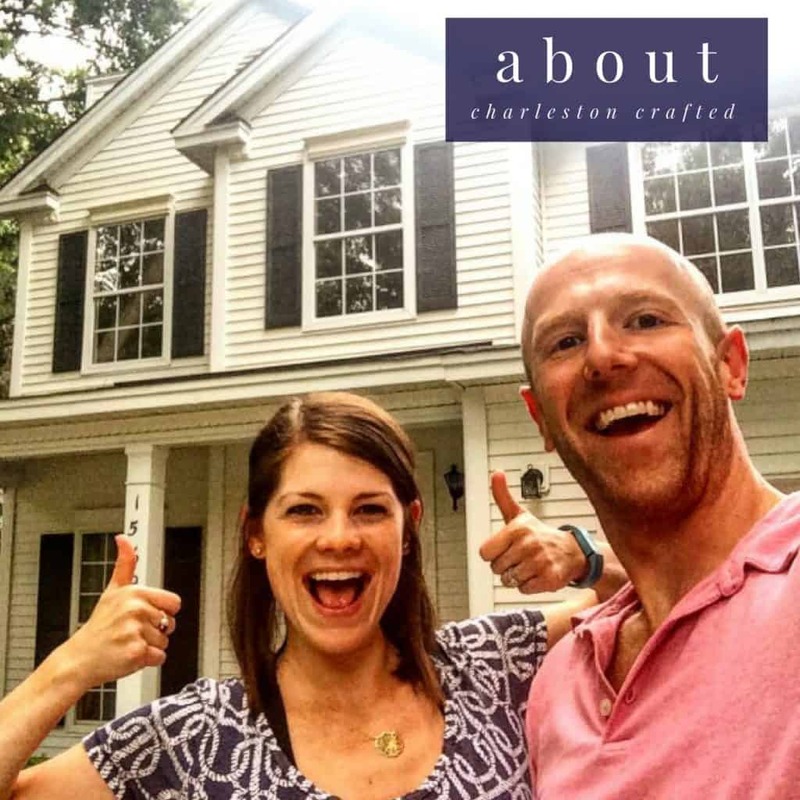 Feel free to email me at Morgan@CharlestonCrafted.com if you need an ear! I have been trying to get pregnant for years with no luck due to PCOS. I even went to IVF clinic and still had no success. While going through invitro I was told that I had a cyst on my left ovary and if push comes to shove they may have to drain it during pregnancy if it had gotten bigger, but like I said I didn’t get pregnant. One day after being sick for about 6 weeks and I went in for my appointment and behold, I am pregnant!!! They have been monitoring my cyst and it has gotten bigger since I have become pregnant and at my anatomy scan, I was told that they may have to go in and take it out. I am so thankful for coming across your story, because I was very worried. Thank you for posting this for others to see. 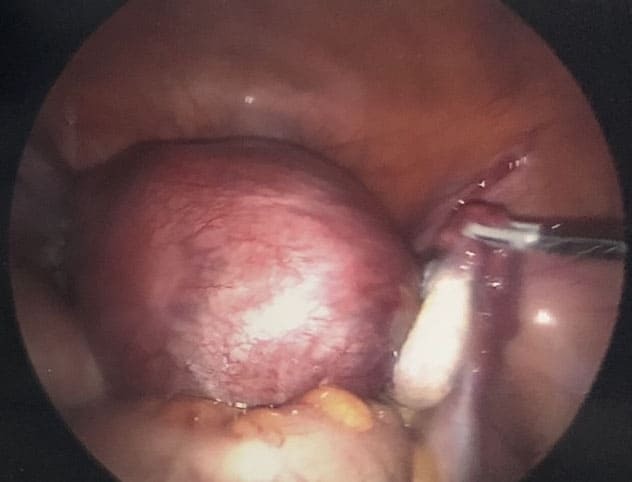 Hi, my doc told me I have cyst (10by13cm) on my right ovary on the outside and at the same time am pregnant, of late i have been feeling pain on the left side does it mean my left ovary could also be affected? the last time i took medicine, painkiller, they gave bloating on the stomach so i stopped. advise please… thank you. Hi Rosemary, I am sorry for your troubles! I would ask a doctor – I can’t give any medical advice. I know that they couldn’t tell from an ultrasound which ovary of mine was infected and it took surgery to be sure which it was, because it was swollen so big. Good luck! !